Glenhill Consulting has reviewed the operations of six Pacific Small Business Advisory Centres, all of which have uniquely differing features. As Credit and Small Business Specialist with an ADB Private Sector Development appraisal team, Jock Struthers reviewed the operations of the Micronesian Entrepreneur Development Centres in the four States of the FSM, Pohnpei, Chuuk, Yap and Kosrae. Of particular interest was the business incubator established in Yap, the UNDP funded supporting program based in Chuuk, and the Pohnpei Small Business Loan Guarantee Scheme. Recommendations to improve the independence and autonomy of advisory centres and improvements to the Pohnpei loan guarantee scheme were provided. .
A new Business Advisory Centre and the draft Small Enterprise Development Act 2000 in Kiribati were reviewed for UNDP. The Business Advisory Centre was embarking on a program to develop a cluster of small industries utilising coconut products, and marketing outer island foods and handicrafts in Tarawa. The review noted the positive progress made in the development of I-Kiribati private sector business and provided UNDP with further assistance options. 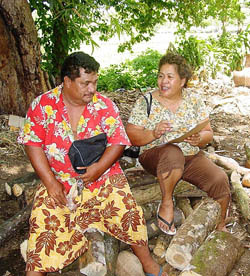 Jock Struthers has twice led teams (in 2002 & 2008) to review the Samoa Small Business Enterprise Centre (SBEC), including its loan guarantee scheme and the availability of microfinance to small business entrepreneurs. Both assignments involved extensive travel throughout the two main islands of Samoa to visit SBEC’s wide range of urban and rural business clients and to observe local infrastructure and development requirements. A wide range of non-client stakeholders were also interviewed including ministers and senior ministry officials, Chamber of Commerce, all the Commercial and Development Banks, other donors, training institutions and professional associations. The outcome each time was a strategy to establish / maintain the SBEC as a viable entity, to economically justify its existence, and to enable NZODA and the Government of Samoa to determine an appropriate level of ongoing but diminishing support. ©2011 GLENHILL CONSULTING LIMITED. All Rights Reserved.